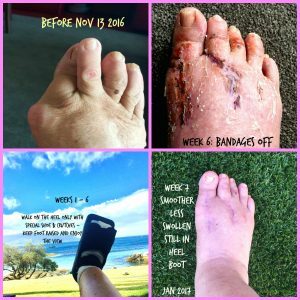 I agonized about the Pros and Cons of bunion foot surgery for many years, living with uncomfortable, often painful, bunions causing deformed toes. So the day finally came when I went into the hospital for reconstructive foot surgery. This involved nearly 2 hours under general anaesthetic while the surgeon removed the bunions and straightened the toes with titanium pins. First the right foot in 2016, which was a huge success. Then two years later the left foot (November 2018). Miraculously and gratefully I was in the hands of the gifted Dr. Craig Hastings and his team in Cape Town and received excellent service from the staff at Vincent Pallotti Hospital during my in-hospital stay. This was followed by 8 weeks of supportive post-op care once I got home, from my devoted husband Nick. I was the most vulnerable I’ve ever been in my life (other than childbirth), and I haven’t wanted to talk about it – until now. I feared hospitals and medical intervention. I prayed that the 1-2 hours under anesthetic be easily handled by my body. Plus using all the tools I knew to prepare mentally, emotionally and spiritually for surgery (see below). Mainly because I did not want people commenting negatively about how they had “heard” dramatically unsuccessful and unhappy experiences from “someone they knew who had bunion surgery and wished they had not”. This was ongoing for most of my life whenever I brought up the subject with podiatrists, exercise and yoga instructors. So my job was to change that reality for myself – doing what I teach and coach others to do…using EFT Matrix Reimprinting, The Law of Attraction, TAT sessions with Tapas Fleming; Ask and Receive session with Pam Altaffer Distance Energy Healing from my go-to Emotion Code Angel, Wioletta Giegel who does the work while you are actually in surgery from her base in London. 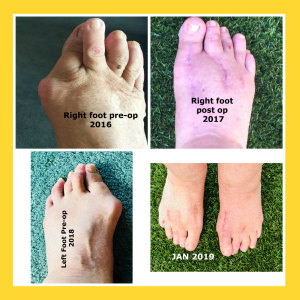 I also want to give a huge SHOUT OUT to the Power of 8 Groups (pioneered by Lynne McTaggart) that I participated in during 2018, prior to my left foot surgery. I also created a daily reminder of my desired outcome on a Vision Board near my bed, showing pictures of healthy, HAPPY FEET. Being off my feet with legs raised (above my heart) for 6-8 weeks. Followed by careful walking as foot stays swollen for 6 more weeks. Plus several months (up to a year) of allowing the bones to grow strong and the foot to return to “normal” in terms of hiking and exercise. All as recommended by surgeon Dr. Craig Hastings. Firstly and most importantly for me, I was pain-free by the time I got home, after the initial first few days with intense post-op medication while in the Vincent Pallotti hospital. Secondly, within a year after the right foot surgery in 2016, I was walking normally and playing golf, swimming and hiking. Thirdly, I was able to use my energy psychology, manifestation mindset and Law of Attraction tools to prepare myself ahead of what felt like a daunting scary ordeal. 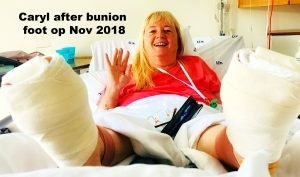 And thanks to my truly wonderful husband Nick I’ve come through it healthy and on the mend from my second (left foot bunion op) as I write this is January 2019. Nick was a SAINT and LOVE HERO all rolled into one, patiently waiting on me “hand and foot” cooking, shopping and helping me shower at night. 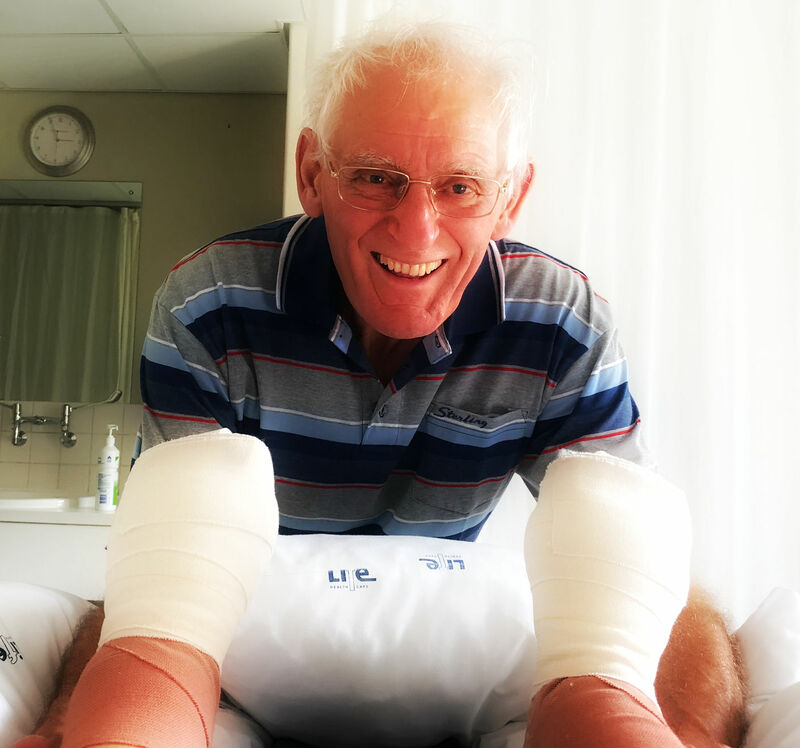 He was also wonderful with massaging the feet after the bandages came off with scar-tissue rescue oil and later Arnica cream to reduce the swelling and inflammation. You can see in this collage how red and raw the foot looks at first after a few weeks in bandages. But it soon healed beautifully! End Result – neat feet…beyond “my wildest dreams”. Can I help YOU preparing your mind and body for surgery? Or helping you break free from a traumatic memory of surgery or hospitals that is affecting your wellbeing. CONTACT ME VIA FACEBOOK MESSENGER @CarylWestmoreAuthor and I will gladly help you.